I think we all took a collective gasp when the big news was posted earlier this week that Style Me Pretty is closing down at the end of April. The biggest panickers? Wedding vendors who used Style Me Pretty as a major avenue for press, visibility, “as seen in” authority-building, and backlinks. Oh, and me, when I realized that one of the best resources out there for quality backlinks for my clients’ SEO is going to be wiped from the internet. 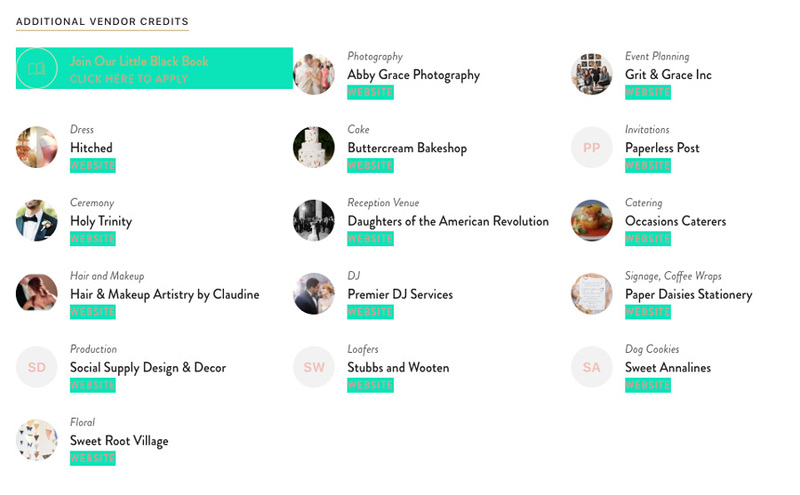 It’s a big deal that one of the biggest wedding inspiration sites on the ‘Net is going away. But what no one is talking about is what Style Me Pretty’s shut down will mean for the search engine optimization of the vendors who were featured there. And let me tell you… it might not be so pretty. A Style Me Pretty feature was coveted by wedding vendors over the years, but I don’t think most realized the huge search engine benefits they were reaping when they earned one. Every single SMP feature included this killer vendor reference at the bottom, showing all of the vendors who were submitted with the wedding. What only geeky SEO nerds like me realized is that these links are all high-value DoFollow links (as shown highlighted in green below). DoFollow links are SEO gold. When a website uses a DoFollow link to link to another website, it passes SEO value and authority to the linked website (almost saying “I vouch for the quality of this site I’m linking to”). The opposite of DoFollow links is NoFollow links. These links point to other websites but tell Google not to pass any SEO value or authority through them (like saying “You can go here, but I don’t know if it’s any good”). Check out more about DoFollow vs NoFollow links here. The thing is, many of the biggest wedding blogs have switched all of their vendor links from DoFollow to NoFollow in recent years, for various reasons. That means a link from The Knot or Martha Stewart Weddings doesn’t help your website’s search engine rankings nearly as much as a link from Style Me Pretty did. With SMP being so high-authority in the wedding space and still offering quality DoFollow links, submitting there was one of my top backlink recommendations for wedding photographers and planners. Now That SMP Is Gone… Now What? The notice posted on SMP on Monday made it pretty clear that they’d be fully shutting down the site and access to all content in just a couple weeks. This means you’re going to lose your backlinks. SMP’s content being taken down is bad news for vendors who relied heavily on SMP for features and didn’t have many features or backlinks from other sites. What to do? It’s time now to build that backlink variety. Find all of your weddings featured on StyleMePretty.com. You can use LinkMiner to find them, and all of your other backlinks. Make note of the full current URL of those pages. Make sure to copy the text that went along with the article to a document, so you have it. Re-submit the weddings to other blogs that offer DoFollow links. Once your wedding is accepted by another blog, find out if you’re allowed to also post it on your own website. If so, do it. Where should you submit? 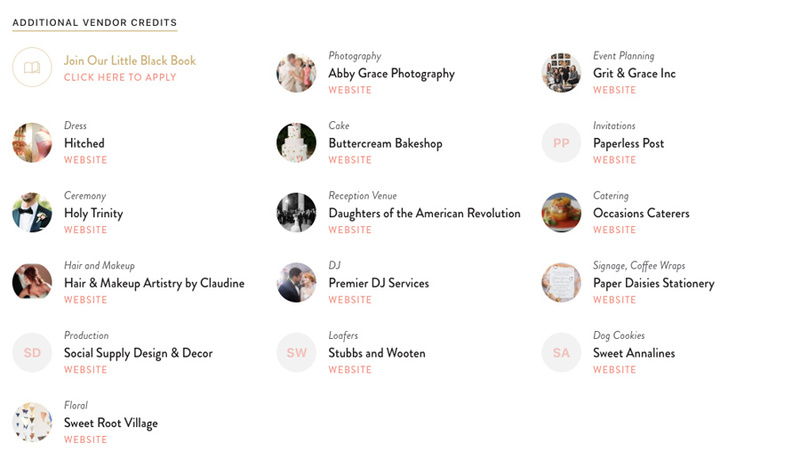 The sites below are some options that offer DoFollow links back to your website on a Real Weddings submission. *More on Moz Domain Authority here. If you know of any more wedding blogs or publications offering DoFollow links, let me know, and I will update this post. Love Inc is also curating a nice list of sites where you can submit former SMP features. One of the biggest lessons wedding vendors can learn from this unexpected closure is that your own website must always, always be the main hub for your weddings and your content. The only website, blog, or platform you own and control is your own business website. Don’t rely on other websites to host your content for you. If you find yourself sending links to prospective brides of real weddings that aren’t on your own website, I’d highly, highly recommend you also include those weddings on your site if the publisher allows it. Invest in your own website and growing your own traffic. You never know what might happen to sites that aren’t yours. Sara Dunn is the geeky best friend for wedding professionals. She offers done-for-you SEO services and website design that search engines love. Her tips have been featured by the Rising Tide Society, Special Events, and Wedding Industry Insider. Start learning from Sara with the SEO Basics Guide for Wedding Professionals. It is unfortunate that Style Me Pretty is closing and I didn’t know what to do next. The list of alternative websites is soo valuable and I want to thank you for sharing it. I want to thank you again for sharing this valuable article and keep up the good work. This article helped me so much! It really shows the importance of cultivating your own audience! Get instant access to my top SEO tips, including only what's working right now. Every creative wedding pro needs a geeky best friend. Let me help you with your SEO and a website design that will bring you inquiries. Curious about SEO services? Let me send you my Welcome & Pricing Guide.